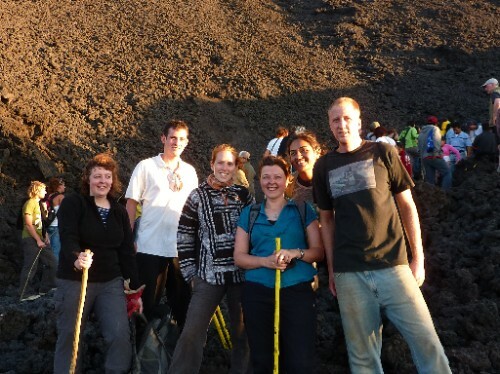 Climbing Volcano Pacaya after a week of housebuilding was quite a challenge for me! Guides with horses taunt you calling "taxi, taxi - esta cansada? Caballos es muy fuerte!" But I was determined to climb the volcano with my own feet! Besides as soon as you got so tired you thought you couldn't continue, the path seemed to flatten out a bit - or we had a little rest! The ascent was quite cloudy which was good as it kept us cool, and also meant that we couldn´t see how far we had to go. In total the climb takes around 1.5hrs. Just as we neared the top the clouds disappeared below us and we saw the lava! It was very impressive and also quite scary as large molten lava rocks kept falling towards us.... It was very warm and my only pair of trainers for walking and house building are a little bit shredded on the bottom. The view behind us was stunning. You can see the 3 volcanos that surround Antigua - Agua, Acatenango and my favourite Fuego (another active volcano with fun smoke puffing out the top!). The sunset was so beautiful!